It's been a very long time since I really enjoyed a score this much. 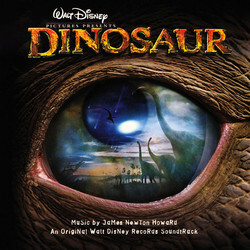 James Newton Howard's music for Walt Disney's computer animated film Dinosaur is easily one of the composers very best efforts. And for once Walt Disney Records got it right, as well. The soundtrack album is entirely devoted to Howard's score, meaning that we don't have to deal with commercial sounding pop songs. In fact, there are no songs in this film, whatsoever. Which is something I welcome, since I don't understand why singing is necessary whenever the people at Disney make animated films. When I heard James Newton Howard's music in the trailer for Dinosaur I knew we were in for a treat. Luckily the wonderful trailer music made its way onto the soundtrack album. This is great, of course, but even greater is the fact that the music is just as good througout the entire CD - the trailer music was no exception. I rarely enjoy every single minute of music on a CD, but Dinosaur really is stunning from start to finish. The CD opens with soft flutes, strings and synths in "Inner Sanctum/The Nesting Grounds". It is all very tender and sweet, but the idyll is soon interrupted by more energetic music, as exotic drums and rythms enter the stage, followed by chanting voices and a glorious statement of the grand main theme in "The Egg Travels". It is not hard to imagine this music being used in dozens of trailers in the future, because the beauty of the theme, coupled with the wonderful orchestrations, make this one of the finest cues on the album and one of the very best film music pieces of 2000. The musical styles in the score range from upbeat, problem free, life-is-good music, such as "The Courtship", to grand adventurous music ("Across the Desert"), to dissonant and dark action music, most notably in "Raptors/Stand Together", which is one of the scores' big dramatic pieces, including some really exciting action parts performed by the quite large orchestra. And apart from the symphony orchestra, Howard adds exotic percussion and choir to the musical palette in some cues as well. While the percussive instruments play typical (or maybe stereo typical?) African rythms througout the score, the choir is used in different ways. At times it is placed in the background, with only supportive and harmonic duties - working as a traditional film music choir, one could say - while it at other times is given a more prominent part in the foreground, where it is employed in a more chanting way - African choir music is the first thing that comes to mind, and sure, the name Lebo M can be found in the liner notes. One can argue wether African vocals should be used in a film about dinosaurs. I think they should, as they evoke a very exotic, djungle sound. It gives the music a very primitive, wild and ancient sound, which I think is perfect. As is the way the composer mixes this style with the sound of the traditional Western orchestra. The scores' only really negative quality is the fact that Howard is a little sparse when it comes to using the various themes he establishes in the first part of the score. It's not really a drawback, per se, but it certainly would have been nice with some more renditions of the main theme - which quickly has become one of my favorite movie themes. I simply cannot stop humming it. Disney's own Dinosaur project has been gestating (as it were) for many years, at one point Paul Verhoven was interested in doing it, although I don't suppose he'd have produced the kind of kiddie fayre that Disney might desire. In the end, we have a kind of live action Land Before Time with computer generated dinosaurs on real backdrops, much like Jurassic Park or the BBC's recent and superb Walking with Dinosaurs. It is intersting to note that, despite the obvious budget restrictions that must have made Walking with Dinosaurs an especially challenging programme, many people have cited the effects on that as being superior to Disney's new film, although I wonder whether this might be because the creature designs are somewhat softened and given slightly more cuddly (for want of a better word) features; kiddies will not be happy if the dinosaurs look too frightening. Whatever the merits of the film, I can't say that I was exactly over the moon when I discovered that James Newton Howard had been tapped to write the music. Another bland JNH score was not a prospect I relished greatly, but in all fairness Dinosaur is an extremely good effort. Yes, it does come across as a fairly typical Howard action effort for much of the time, but has enough enjoyable moments effort that falls into the catergory of entertaining, if not indelible (almost damning it by indifference I suppose). To promote the film, Disney took the nifty step of putting a lengthy teaser featurette (as they like to call it) before screenings of Toy Story 2 - something that occasionally overshadowed John Lasseter's brilliant film in discussions. However, much was made of the music in the featurette and fans will be pleased to know that it is contained on this album as the first couple of tracks. After a plinking percussion opening and a little comedic orchestral interplay comes the moment everyone is waiting for, the big African choral effort which has the fairly imposing footprint of Lebo M stamped all over it. The result, while perhaps becoming a bit old hat (it could easily come from The Lion King or Power of One or even Cry Freedom) is still very stirring and Howard's orchestral backdrop provides a very tuneful counterpoint to the choir. Howard's tunefulness seems to have almost reached a peak with Dinosaur; while it is not necessary to have themes that repeat over and over to make a score, when there is nothing else to latch onto, music can just ramble terribly and that is something I've felt happens in far too many of Howard's scores. However, here he has written a couple of pretty memorable themes, the first being the inspiring main theme, as well as a more tender theme for the friendship that develops between the various beasts deployed as characters. Throw them together with a couple of fractionally uninspiring action cues, which rely on a little too much banging and crashing - surprising given Howard's extremely good use of the orchestral pallette elsewhere - and you have a very entertaining score. The album doesn't really have any overtly slow moments and is just about the right length, so pretty much liable to at least be entertaining, even if the showy choral passages are likely to stick in the mind afterward.